Ask Conservative Evangelicals these questions and carefully consider their response. I've heard a number of well-known CE's express publicly their criticism of Graham's ecumenical evangelism and their rejection of the practice. The difference is that while they've rejected the practice they've not condemned Graham personally and separated from him (which is kind of pointless seeing that he's in heaven). There is an aspect of separatist fundamentalism that seems to need a visible enemy and it seems that, even in death, Graham continues to be the one, especially considering that ecumenical evangelism doesn't seem to be a thing anymore. I wonder how much things like Operation Christmas Child cross over to liberal churches. Granted, it's not stadium events like Graham's, but one might suggest that there is at least a vestige of ecumenical evangelism out there, no? That noted, my biggest objection to Graham's rallies isn't that ecumenical cooperation resulted in misdirected efforts at discipleship. It's that so many "converts" at Graham rallies got no discipleship at all unless they found a Bible-believing local church and pursued fellowship and membership. Blaming others for problems is fun, don't get me wrong, but sometimes we need to look in the mirror. Emphasis on the foreign field while ignoring "our Jerusalem"
Agreed. The man is dead, and young people couldn't care less who he was. That era is past. Even the young adults in my church don't know or care who his son is. The article would have made sense 20 years ago. There are other, more worthy foes to fight. Revoice, anyone? Leave Billy Graham alone! As Dr. Oats always said,, "he's dead now, so his theology has been straightened out." I'm not saying that I agree with Wally Morris' conclusions about Billy Graham, but Graham's legacy and continued impact on broader evangelicalism, including fundamentalism, is a relevant topic. It's entirely reasonable for the FBFI or any group to editorialize on Graham's life and ministry. When BG died, it was "too soon." Now it seems like the bar has been moved to "never." What I am saying is that his ministry and legacy is only directly relevant to men who are 50+. He and his ministry had no impact on me, and it has no impact on folks younger than me. The era of mass evangelism is largely over; that ship has sailed. We can draw appropriate lessons from Graham's association with apostates and other groups who, by any critical examination, are not properly Christian at all. But, there are other, more relevant ways to make that same application and draw those same lessons. Tyler, it's bizarre to me that you would claim that BG's ministry is only relevant to those who are over the age of 50. That's simply not true. BG's influence continues to shape broader evangelicalism. He does have an impact on you, whether you want to admit it or not. He remains an incredibly influential figure in Western Evangelicalism. Just because BG is dead doesn't mean that his ideas, practice, and overall influence aren't still coursing through the American church. His fingerprints are everywhere. I've never read a book by BG and never listened to a sermon by the man, but I recognize that his ministry had and continues to affect me, whether I like it or not. From the FBFI's point of view, BG remains a relevant concern, and rightly so. Disagree with the article all you want, but to dismiss it as the FBFI simply flogging a boogeyman is insulting to Wally Morris. Let's be honest with each other. Billy Graham's influence was vast. He's dead, and so is the kind of mass evangelism he championed. My point isn't so much that Wally was wrong; he's right. I shall repeat - Wally's is right! I just wonder why on earth we continue to see critical articles flogging Billy Graham. How long will they continue? When will they end? I grow tired of hearing about Billy Graham's problems with separation. Isn't there a more relevant, contemporary application to highlight the same problems? At some point, can we quit flogging a man who is already dead? Meh. Who cares? I absolutely guarantee you nobody in my church cares about Billy Graham's methods. I don't either. We evangelize responsibly and properly, I don't fellowship with non-Christian groups and the next time I'm invited to address tens of thousands of people at a mass evangelism rally, I'll make sure I triple-check the CVs of every speaker, lest I be guilty of "platform fellowship." But, to parachute back into the real world, that won't happen. I have to believe many Christian across our fair land have bigger problems in their ministries and personal lives than worrying about the sinister influence of Billy Graham's doctrine of separation. If the FBFI wants to run an article analyzing the Revoice conference, then my ears will perk up! The other FBFI "whipping boy" is John MacArthur! Being 'agin' ecumenical evangelism is one thing! But the MacArthur thing is just ministry envy! I agree that Graham's ecumenical evangelism was wrong and harmful and so do most, if not all, of the CE's. The problem I had in the 70's and 80's and continue to have is that the attack continues primarily on the man and not on the issues. The younger generation has little knowledge of who BG was other than a "hero". But if you engage them on issues you'll get some real work done. It strikes me that the first time I was pointing out the difficulties with Graham's methods, Reagan was President and I was a new believer. Now I'm not a fan of mixing real believers with liberal "Christians" in evangelism at all, but at the same time, it strikes me that the bigger fish to fry with Graham's methods is some things we see all too often all over today; the infatuation with being big in terms of numbers, an emphasis on glitzy presentation in lieu of theological depth, and finally a dearth of effective follow-up and discipleship. Does Graham's ministry exemplify all of these? Sure. However, my concern is that if our ire is focused on Graham, then we're far more likely to miss the examples that are of far more concern to us; those in our own churches. Or, put differently, no problem with teaching the good and bad about Graham in seminaries, theological forii, and history classes. Teach him alongside others who paved the way for him, like Billy Sunday and Charles Finney, and for that matter George Whitfield. But let's keep it in perspective of "he's not the bogeyman now." Don't obsess over certain men and personalities, and go beyond the same tired hobby horses. Engage CURRENT theological revisionism in your pulpits and in print. Write about the sexual revolution, about the reliability of Scripture, and about epistemology - write about all of it. Don't make CEs the enemy; the revisionists are your real enemy. Be a real fundamentalist. Be a historic fundamentalist. Look at where the attacks against the faith are coming from, and adjust your fire. Your real enemy are those who seek to redefine or deliberately undermine the faith, not those whose doctrine of separation is a bit looser than yours. Fight and be militant for the faith, not a particular, time bound expression of it. Critically examine the packaged theological system you've been given, and think for yourself. Don't engage personalities. Engage issues. Above all, engage current, relevant issues that your contemporary audience will understand and appreciate. They're all very good and very important books. I appreciate SI posting a notice about my article at P&D. I am also working on an article about the preaching of Billy Graham. Apparently some did not read my article carefully and are not aware of what is happening in Evangelicalism. The article never “condemns Graham personally”. The fact that younger Christians do not care about Billy Graham and some of the theological issues of his ministry which are still impacting our churches today is irrelevant. Our job is to help them understand why it IS relevant. That does not mean that we ignore other important concerns. But to dismiss the continuing impact of Graham’s philosophy is naive and theological malpractice. Concerns about the continuing impact of Graham’s philosophy cannot be dismissed by using worn-out accusations of “whipping boy” and that Fundamentalists “need an enemy”. Such statements reveal an unwillingness to wrestle with genuine issues and conveniently shut down discussion by accusing those who point out problems..
Evangelicals today continue to practice Graham’s philosophy of ecumenical evangelism. Let me give one illustration I did not use in the article. After the SBC Annual Meeting this summer in Texas, Southern Baptists joined with Greg Laurie in Dallas-Fort Worth at his Harvest America rally in a mass evangelism event, an event promoted by Southern Baptists. I talked with one of the organizers of this event, and he admitted that all churches in the area were invited to participate and work the event. Laurie also used the phrase “make a commitment to follow Jesus”, a phrase made popular by Graham. How can anyone say that Graham’s philosophy of evangelism is not relevant or used any longer? The facts say otherwise. My article is not motivated by jealousy of anyone. To make that accusation assumes knowledge of personal motivation and assumes what they cannot know. The article is about more than Graham. The article is also about well-known Evangelicals who emphasize theology but are quiet about this aspect of theology. Anyone who thinks I am “attacking the man and not the issues” didn’t read the article carefully. Some suggest that we should “look in the mirror” and solve our problems first before we express criticism or concern about something. If true, then no one would ever be able to try to correct anything or anyone since we all have sins and problems which will continue the rest of our lives. Although it sounds very pious, the “look in the mirror” suggestion is naive and assumes knowledge of theological logs and splinters. The quote from Dr. Oats is correct but assumes more than intended. Graham’s theology is now “correct” (as all of ours will be one day), but the impact of his incorrect theology continues now. All of us should care about that. I think your points are good and the article is good. But, to be honest, I've read so much about separation that uses Graham as a foil that, whenever I see another article by a Baptist fundamentalist that highlights Graham, I immediately think of Reagan ("there you go again ..."). On the phrase "make a commitment to follow Jesus"
On the phrase "make a commitment to follow Jesus". Any phrase without the broader context can be flawed! 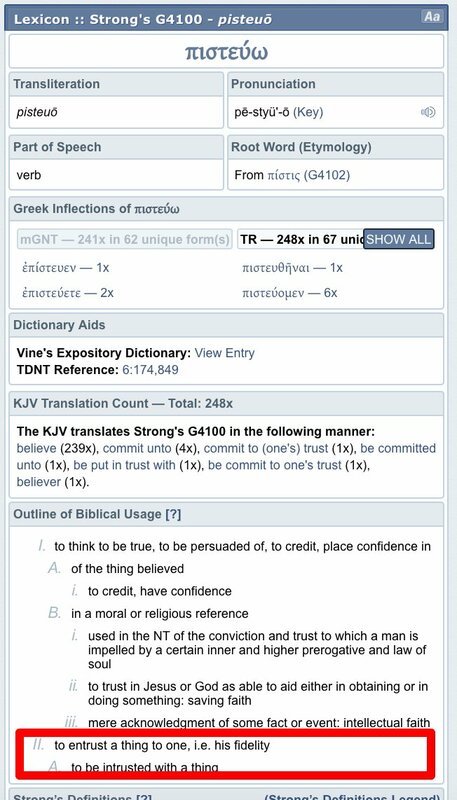 The Greek verb πιστεύω as "commit"
On good "Ecumenism" / bad "Ecumenism"
OR ... it depends on how Ecumenism is defined! BG partnered with liberals and RC's in his evangelism campaigns. This is well known! I witnessed it personally when BG came to Denver and I was pastoring a small Baptist church there! This was serious and should not be forgotten!!! There are areas where cross-denominationalism works. I could (I don't at this time) support a crisis pregnancy center with Christians who do not agree with me on baptism, eschatology, et cetera! The Lordship of Christ? That's a deal-breaker obviously! On salvation? Ditto! Reaching out / succoring the poor? Samaritan's Purse & Feed My Starving Children. What left an impression on me in the battle against BG's sinful ecumenical evangelism was the failure to stress the issues. I knew I was to separate fromm BG, from anyone who associated with BG, from anyone who might say anything positive about BG, and anything that looked like what BG was doing. I recall many meetings where BG was soundly condemned but "why" was seldom if ever mentioned. He was "the enemy" and treated like an apostate. This is the first time I've heard about Harvest America which inclines me to think that it hasn't been a priority issue for us. Word meaning is determined by context. Isn't this the main problem with ecumenical evangelism? Graham needed to present a gospel that appealed to and supported the various stripes of "christianity" present. Words needed to be used that would be just right so that all groups present on the platform could say, "I like that! I can use that and not lose anybody!". The catholic listener hears "commit to follow Jesus" to mean "go back to the mass and keep the sacraments". Greg Laurie's Harvest Crusades uses the term "Profession of Faith," but will interchange that with commitment to Christ. Here is what is on their website from the FAQ page. "What's a "profession of faith"? We believe that only God has the power to "convert" a person's heart to Himself. We use the term "profession of faith" to indicate that a person made a public, formal profession of a desire to follow Christ and live by His Word (whether that be a first-time commitment or a recommitment). While many of these people will be discipled, grow in the grace and knowledge of Jesus Christ, and bear lasting fruit, we know that this is a matter of the heart and some will not continue on in the Christian faith (see Matthew 13). This is the reason that there is a follow-up process in place—to ensure that as many people as possible are given the tools, prayer, and biblical counsel that they need. What happens when someone makes a profession of faith? Those making a profession of faith in Christ are paired up with a Decision Follow-Up Worker and receive a free Start! Bible. The Decision Follow-Up Worker prays and encourages the new believer. He or she also documents the person's decision to follow Christ. The documentation is then given to a local church representative on the night of the crusade. Within 48 hours of the crusade, local churches mail letters and make phone calls to the new believers. To ensure the success of this step, Harvest Crusades utilizes mailings and other resources to encourage the local churches to follow up with all new believers. Harvest also has follow-up curriculum available for churches that haven't yet developed their own." Now, this would be a good subject for an article. Much more contemporary and relevant than more about Billy Graham. Whatever you think of BG, he never said or did this! Anyone have an issue with this phrase? "Trust Christ as your Savior"?